Save $8.00 on Your Order with Advantage Today! SeaHealth Plus is an all-natural, exclusive liquid polyphenol supplement. 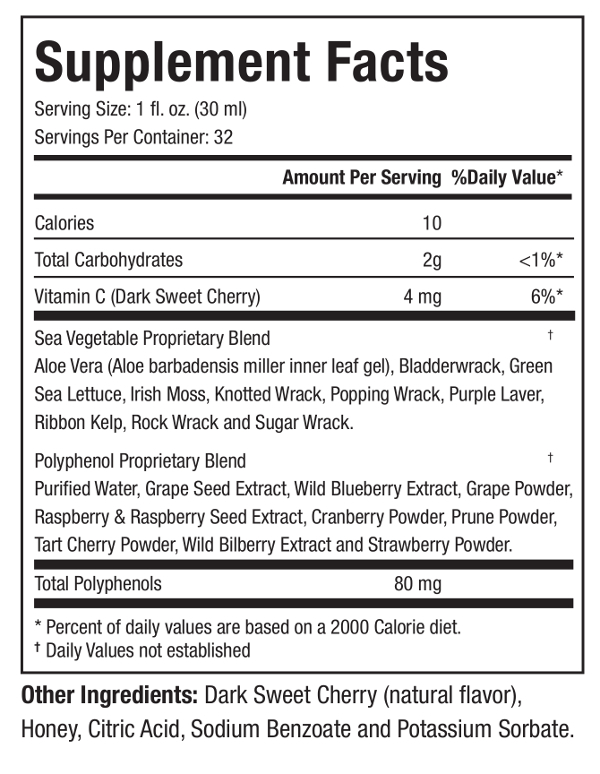 This blend consists of fruits, sea vegetables, (e.g. bladderwrack, green sea lettuce, Irish moss, ribbon kelp, wild blueberry, strawberry, raspberry) trace minerals and IASC certified Aloe Vera. SeaHealth Plus is a 100% natural, cold processed supplement of exceptional quality with a great natural black cherry flavor. It has the antioxidant equivalent of consuming 5 servings of real fruits and vegetables, making it a simpled inexpensive way to help meet your daily needs. We only use the purest form of polyphenols, giving you the most potent anti-oxidant and benefits. Concentrated, broad-spectrum blend of 10 antioxidant-rich fruits, 74 trace minerals from freshly harvested sea vegetables and IASC certified Aloe Vera to help regulate inflammation. Anti-oxidant equivalent of 5 servings of fruits and vegetables to help meet daily needs. Contains a proprietary blend of fruit extracts and concentrated powders selected for their anti-inflammatory properties. Liquid format promotes greater bioavailability. A great compliment when combined with liquid OmegaRx 2. Suggested Use: Adults should take 1 fluid ounce (2 tablespoons) or 1 capful daily prior to a meal or 15-30 minutes after a meal. 32 servings per bottle. Polyphenols support the enzymes that optimize metabolism so you can promote high energy levels. Have used for years. 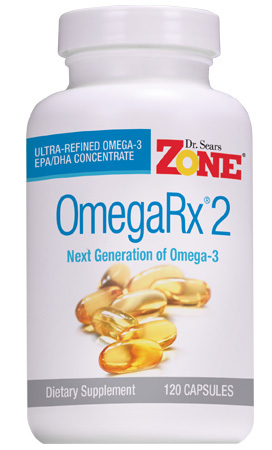 I put it in a small cup with my liquid fish oil and it covers most of the fishy taste and I enjoy the berry flavor. I have been taking SeaHealth Plus for years, and I expect that it’s doing its job. However, I HATE the bottle it comes in! It drips and makes a mess every time I use it. If I clean it up with a kitchen cloth, it makes permanent stains, which I know means that the ingredients are the good, dark kinds with lots of antioxidants. But as a previous reviewer says, the quality of the bottle should reflect the quality of the ingredients. I recommended it to a friend who stopped using it just because it made such a mess. PLEASE change the bottle. 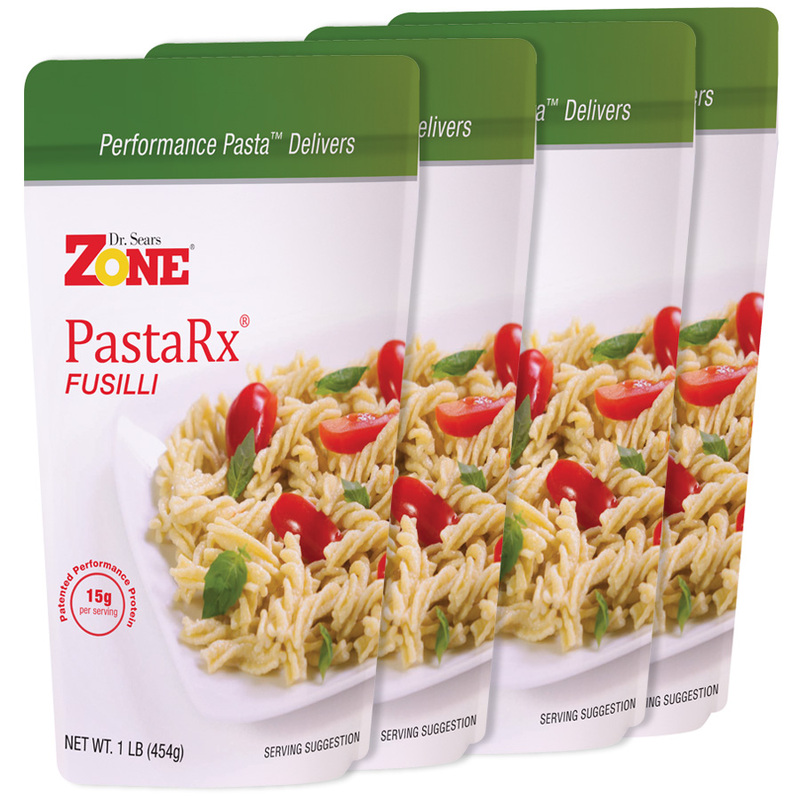 I like this product the taste is like no other, it fulfills my craving for fruit/veggie taste. I took it years ago and found it again taste you can’t forget. Just like the majority of the review say… great product in a ****py container. The lid will not seal properly so the “shake well” part is always a berry colored mess. When you have such a great product, you would think that the container should be worthy of the product… especially when you are dealing in such small measurement amounts per day. I will keep using it but I’m currently looking for a better storage option for future orders. We have been taking this for years. We take it with us wherever we go and when we go overseas we order it to be delivered to our destination hotel well in advance. The same goes for our Omega Rx 2 and MaquiRx, so our three pillars of health are with us all the time. A great cherry taste. Fabulous product! This is great stuff. I drink a gallon of water a day. 4 quarts. I have sea salts with 72 trace minerals. For each quart I add 1/2 tbsp of sea salts. Is that okay? I have not purchased your sea salt product and I do intent to try it out. Tastes good,great way to consume flavonoids. Sodium benozate is a necessary preservative to prevent microbial growth in the Sea Health Plus because it is in a liquid form. Benzene is a carcinogen and listed on the California Prop 65 list, whereas sodium benozate is not. It is exceptionally difficult for sodium benozate to be converted to benzene.Nonetheless, we did analyze Sea Health Plus for benzene levels and found the levels to be significantly lower than even the lowest levels on the Prop 65 list (24 ug/day via oral intake), which has the most rigid standards in the world. The levels of benzene in natural water and diet soda are far higher. However if you want zero tolerance without microbial contamination in a liquid form, then taking our polyphenol extracts in capsule form and adding them to a glass of distilled water is your ideal choice. Of course, then you would missing out on the 72 trace minerals and unique polyphenols found in the sea vegetables in Sea Health Plus. I like it. I use it in the same manner someone else mentions, add my liquid fish oil dose and drink it. It is a bit of a treat, so I sip it. Taste slightly sweet and I rarely have sweet stuff.